One claim frequently heard regarding extreme heat waves goes something like this: ”Since this heat wave broke the previous record by 5 °C, global warming can’t have much to do with it since that has been only 1 °C over the 20th century”. Here we explain why we find this logic doubly flawed. One can ask two different questions about the influence of global warming on heat waves (Otto et al. 2012), and we take them in turn. 1. How much hotter did global warming make this heat wave? We have some trouble with framing the question like this, because it tacitly assumes that the same weather situation would have also arisen without global warming, only at a (say) 1 °C lower temperature level. That need not be the case, of course, since weather is highly stochastic and global warming can also affect the circulation patterns of the atmosphere. But even if we accept the basic premise (and it could be meant in a purely statistical sense, although that is not usually how it is expressed), would an average anthropogenic warming by 1 °C in the relevant location mean that 1 °C is also the amount added to an extreme event? Only in a linear climate system. Imagine a heat wave that pushes temperatures up to 30 °C in a world without global warming. In the same weather situation with global warming, you might expect that this weather then results in a 31 °C heat wave. But that could well be wrong. Possibly in the situation with warming, the soil has dried out over the previous months because of that extra 1 °C. So now you lost evaporative cooling, the incoming sunlight turns into sensible heat rather than a large fraction going into latent heat. That is a non-linear feedback, and not an imagined one. Detailed studies have shown that this may have played an important role during the European heat wave of 2003 (Schär et al. 2004). The basic phenomenon is familiar to oceanographers: if the mean sea level in one location rises by 30 cm, this does not mean that the high-tide level also rises by 30 cm. In some cases it will be more, due to nonlinear feedback. I.e., a higher water level increases the flow cross-section (think of a tidal inlet) and reduces bottom friction so the tide rolls in faster, reaching a higher peak. The tidal range increases as well as the mean sea level. Numerous other non-linear mechanisms are possible, which we are only beginning to understand – think of the recent studies that show how changes in snow cover or sea ice cover as a result of global warming affect weather systems. Or think of factors that could affect the stability of particularly strong blocking events. Thus, we’d be very cautious about making an essentially linear, deterministic argument about heat extremes to the public. 2. How much more likely did global warming make this heat wave? For this question, it is easily shown that the logic “the greater the extreme, the less global warming has to do with it” is seriously flawed. The change in probability of certain temperature values being reached can be visualised with a probability density function (see Figure). The probability distribution could be shifted unchanged towards warmer values, or it could be widened, or a combination of both (or some other deformation). 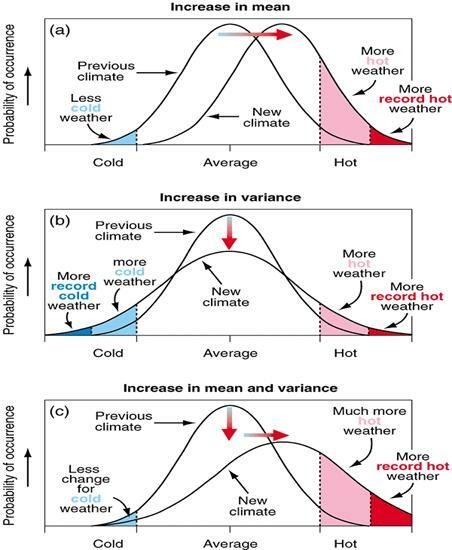 IPCC (2001) graph illustrating how a shift and/or widening of a probability distribution of temperatures affects the probability of extremes. 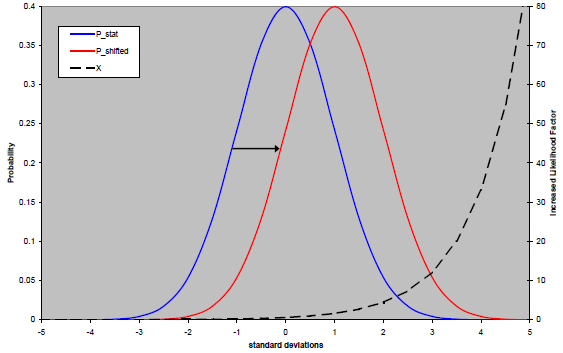 For illustration, let’s take the most simple case of a normal distribution that is shifted towards the warm end by a given amount – say one standard deviation. Then, a moderately extreme temperature that is 2 standard deviations above the mean becomes 4.5 times more likely (see graph below). But a seriously extreme temperature, that is 5 standard deviations above the mean, becomes 90 times more likely! Thus: the same amount of global warming boosts the probability of really extreme events, like the recent US heat wave, far more than it boosts more moderate events. This is exactly the opposite of the claim that “the greater the extreme, the less global warming has to do with it.” The same is also true if the probability distribution is not shifted but widened by a constant factor. This is easy to show analytically for our math-minded readers. Graph illustrating how the ratio of the probability of extremes (warmed climate divided by unchanged climate – this increased likelihood factor is shown as a dashed line, scale on right) depends on the value of the extreme. So in summary: even in the most simple, linear case of a shift in the normal distribution, the probability for “outlandish” heat records increases greatly due to global warming. But the more outlandish a record is, the more would we suspect that non-linear feedbacks are at play – which could increase their likelihood even more. Update 29 March: New Scientist magazine cites this RC post in an article about the “summer in March”. Schär, C. et al. The role of increasing temperature variability in European summer heat waves. Nature 427, 332–336 (2004). So if the mean temperature is going up everywhere, why don’t we have heat waves everywhere too? I think I know the answer, but want to hear your viewpoint. Bingo. That used to be true, a decade ago. Looking at the paper, I found it odd that “Most active tornado month on record (April) since 1950” is listed as a meteorological record-breaking month and then an impact is listed that wasn’t associated with that event. The Joplin tornado, with 158 fatalities, occurred in late May, following what was, by many measures, the quietest first three weeks of May on record. Meteorologically, the Joplin tornado was a “typical” violent tornado and was very similar to a nearby tornado from 2008 with the exception that it hit a population center of 50000+ people, rather than 400. The article by Wallace that Andy Revkin recommends is not a scientific article about climatology or meteorology, but an opinion piece about how scientists ought to communicate with the public regarding the relationship between anthropogenic global warming and extreme weather events. As such, Wallace’s scientific publication record has little bearing on the merits of his opinions regarding communication strategies. As far as I can tell, Wallace seems to be saying that scientists should not suggest to the public that the increasing number of extreme, and indeed unprecedented, weather events occurring simultaneously all over the world, events of exactly the sort that climate science has predicted would result from anthropogenic global warming, are in any way linked to global warming. I admit that I find it hard to be sure of exactly what Wallace is saying. In particular his closing paragraph, which Andy Revkin quotes, appears self-contradictory and incoherent. SecularAnimist – I think Wallace’s point is that highlighting record meteorological events as evidence of global warming, or attributing individual events to global warming may be a losing communications strategy due to the difficulties and potential for subjectivity with such assessments. See Harold Brooks post above for a possible example – is it an extreme event when there are fewer tornadoes than normal? Wallace’s article is mainly proposing that climate scientists should instead place extreme events within a wider context – alongside other growing environmental, demographic and resource issues – to provide a more vivid window on the future. I agree this seems contradictory. Not sure how you can suggest an event is a ‘harbinger’ without attributing it to a cause or causes. Using standard deviations taken from data by month, or season, is informative but, I’m sure, doesn’t capture all the information in the data. For example, the Madison 83F broke the March record by 1F (and note other places that broke daily records by 20-30+F, and broke *April* records in March), but did so 10 days earlier than before, in a season with rapidly increasing averages. So the delta of 1F doesn’t tell the whole tale. Data for 1.5 centuries is enough to make the SD for a given day of the year of some use. I suppose, given the gradual seasonal changes, there would be a good way to use data from sliding windows around each date, with the window width determined from the data itself, but deciding just how is beyond my Statistics 101 expertise. Look, IMO, it’s almost irrelevant what Wallace was supposed to be saying in that final paragraph. It simply doesn’t deal with attribution science at all and shouldn’t be used by journalists to contradict a review of the science of extreme weather attribution. And it is not the job of scientists or journalists to be armchair psychologists and developing communications strategies that soften the blow. Perhaps finding a better way to tell people how bad it’ll be is laudable goal, but doing a tap dance around the issue is clearly not the way to go. If they think they’ve figured this quandary out, they are just wrong. Their job is to get the information out there in the meantime. This is the same type of thinking that leads to US foreign wars being covered like Playstation games. Has anyone looked into the cold spell over NW Canada, Alaska, and NE Russia? The magnitude appears to be equal and opposite in nature, although the extend cannot be ascertained from the Mercator projection. Are these related? For several decades hydrologists have spoken of the Noah and Joseph effect; ‘Noah’ because extreme events, like ‘the flood’, do not follow the pattern of lesser floods; ‘Joseph’ because climate variables are auto correlated. One of the fundamental tenets of statistics is that the data should come from a homogenous population. When an extreme event occurs it is often an event from a different statistical population. For example, in Oman for most of the country for most years, rainfall is mainly in the winter. Sometimes the monsoon, which normally touches just the southern part of the country, reaches further north and heavy rains occur in the summer: an event which is hard to predict from an analysis of ‘normal’ rainfall. Similar factors could apply to droughts. For example a ‘standard’ drought might have anticyclonic conditions with gentle wind bringing bring air from a warm area; in ‘normal’ years the drought might be broken by wetter, colder air moving in from the opposite direction. A severe drought could be caused by a change in circulation patterns bringing air from a ‘hot’ rather than a ‘warm’ area or diverting the ‘wetter, colder’ air somewhere else. This means that a small change in weather circulation linked to other climate changes could precipitate a (different type of) drought way outside past experience. If those changes in circulation are as predicted by climate models then the drought can be attributed to climate change. If they are not, it may just be natural variation. Brian @28 and Rick @55 To get a practical idea of what kind of extreme would result if these anomalies were in July in the U.S. Midwest, it’s instructive to look at 1936 and 1995. The former represented surface temperature extremes obtainable in a severe drought, the latter when the ground was fairly moist before the event. Surface temperatures were lower in 1995, but dew points were really extreme (low 80s F, 27-30C) and a lot of people died in Chicago. From another perspective, it would be interesting to apply the anomaly in sigma from the current event to July values of 500 mb height and 1000-500 mb thickness (equivalent to average layer temperature.) The forecaster’s crude rule of thumb for the latter is to take the thickness in dm, subtract 500, and then add 15 for the max temperature in degrees F. That’s for moist ground. If the 500 mb height was over 6000m we’d be in new territory. I think I just heard on the radio that the IPCC is releasing something on this subject today. Does anyone know anything about that? Is it out yet? Oh boy. Yet again with the no warming for 10 years meme. 10 of the hottest years on record as I see it. I started out in the thread discussing Jeff Masters recent comments on shifting means and probability of the recent heat in the Midwest. I pointed out that when the mean shift is small compared to sigma, it may be difficult to make a practical application of what Dim and Stefan have done here. But, I noticed in answering Larry that sigma is seasonally dependent. In the summer it is smaller than in the winter in the Northern Hemisphere. So, I reviewed the gistemp 100 year trend maps for the four seasons just now and it looks as though the mean shift is pretty similar between them both in magnitude and in spatial distribution. In the summer, where sigma is smaller, the situation could look more like the illustrative graphs presented here where the mean shift and sigma are comparable. If the mean shifts by 0.7 sigma or so, then these graphs describe the situation today for one season at least. So, my comment about lack of practical application may only apply in more variable seasons for now. How can a sea-ice loss, which exposes sea-water that must be no colder than -2C, cause a serious cold event? The presence of open seas has a moderating influence on temperatures, as any coast dweller understands. A “warm” event that reduces sea ice extent cannot generate an atmospheric circulation that is colder than the temperature of liquid seawater. Unless “warm” is now “cold”. Thank you! That corrected some of the misconceptions I had. #59, Dan H, That is 1/2 of winter’s normal extent. There is less of it going around the North Pole. Simple enough?? Geneva, 28 March 2012 – Evidence suggests that climate change has led to changes in climate extremes such as heat waves, record high temperatures and, in many regions, heavy precipitation in the past half century, the Intergovernmental Panel on Climate Change said today. Sigh, another day, another stupid WSJ editorial…it’s almost as predictable as high temperature records. You might think that the WSJ would be interested in a fact based reality. You would be wrong. That is not telling me much. Are you saying that one half is balancing the other, as to the reason for the cold equaling the warm? Doug H. – You are exactly wrong. A warm event can displace/block colder air whose temperature is unrelated to the temperature of sea water. It is this type of effect that creates the Warm Arctic/Cold Continents pattern. You need to read Dosbat and the papers Chris R has been discussing. Aaack – Previous comment directed at Doug Proctor not Doug H.
Thanks KM and ER. Is this the appropriate thread to discuss it? Will there be a thread dedicated to it? Or should we take it over to the open thread? #74–It seems appropriate–not to say highly relevant!–on this thread to me. I read it quickly, and haven’t gone back over it yet. But it seemed very cautious to me–“not that there’s anything wrong with that!” It did have some hints that regional-scale modeling is starting to bear some fruit, or so I interpreted a couple of points. Given Arctic amplification, I didn’t understand why that should be the case. Ack! “1-in-20 might become 1-in-2”–of course! I guess I have been banned from posting on Skeptical Science so I thought I would try here to see how things are. I may disagree that weather is highly stochastic. Weather seems to have some well established patterns. Record high temperatures are not so randome but occur because of certain predicatable conditions. Mostly a blocking pattern that continues to pump warm air from one area to an area that is usually cooler. In the middle of the US, nearly every low pressure system that crosses the plains will first raise the temperature above normal (in some cases by serveral degrees, by pumping warm gulf air into areas that are usually cooler) and as the low passes the area the temperature may drop nearly the same degrees below normal as what had been above normal. You can have 40 F degree temp swings in a couple of days if you have a powerful low pressure system. Because of this I question that you can use a normal curve to explain extreme weather events. My understanding for bell curves is the requirement that the variables be random. In a heat wave the temperature of day one will effect the temp of day 2 and so on, the heat will build. Each day effects the other and are linked. It is not like a dice throw where the previous throw had no effect on the next throw. In weather patterns this randomness is not the case. Relevant comments and criticisms welcome. Some facts to go with your “Geneva, 28 March 2012” announcement. As a researcher it is good to look at all the information before drawing strong conclusions or seeing patterns where none may yet exist. I found this site to be very interesting in the current environment to proclaim that exterme weather events are proof of climate change getting worse. It has some major US cities and lists of exterme weather events for the entire known history of the cities. At the end of each page is a list of all the known extremes. Hot, cold, rain, snow, etc. If you really start reading the material you will see that one year is listed as the hottest year in the data base, then a few years later you have one of the coldest years. One year is the wettest, a few years later you have a really dry year. The same year has some extremes. Warmest March ever with the coldest December. If you take an honest look at historical weather events, it is far from certain you could conclude that events are getting more extreme. @Tokodave 71 – that WSJ opinion piece is about as a academic as a Superpac ad. Bill Happer’s background isn’t climate, and his politics radiate from his Chairmanship of the Marshall Institute. Where’s Elmer Fudd when you really need him? How far? .05 two tailed test, or what? It has some major US cities and lists of exterme weather events for the entire known history of the cities. A handful of US cities are not the world. Odd that you’ll reject the database of world temps and suggest, that somehow, a very small number of US cities refute that record. If you take an honest look at [local] historical weather events, it is far from certain you could conclude that [globally] events are getting more extreme. Since, as a researcher, it is good to look at all the information before drawing strong conclusions or seeing patterns where none may yet exist. My guess is that you are not a researcher. Or so I am thinking. That was not the intent of link to the cities I posted. The point of the Original Thread is that global warming is pushing the globe to more extreme weather patterns. By showing the historical variablility of weather patterns and extremes (one year has a very cold month, but also one of the warmest month…or the variability of snow and rain from year to year or even within a year…a bad drought in one month then heavy rains a few months later…Texas has experienced this most recently). By viewing the history of extreme events (heat, cold, wet, dry) in this selection of cities, you can see that extreme events have been taking place the entire historical record. Here is a link to the entire US. December 1909 76% of the United States was very cold. In March 1910 (only a few months difference) 92% of the United Stats was very warm. Maybe explaining things clearly faces challenges more on the receiving side than on the sending side? Math can be tough, but maybe that is not the real problem? Please present your “facts” and your lecture on “looking at all the information” to the IPCC. All I did was provide a link to the IPCC report. Norman holds the distinction of being the only SkS participant to receive a “time-out” (a rescinding of posting privileges [NOT a ban] for 2 weeks, with a reinstatement of those privileges after the time-out expired). After his time-out, his posting history became much more circumspect. But with the reinstatement of posting privileges of certain others participants, he became re-emboldened. His earlier behaviour reasserted itself even more strongly, to the point of being habitually off-topic. After yet more warnings his posting privileges were rescinded. This time for a longer period of time. Again I must point out, Norman was given more latitude, due process and chances to ameliorate his aberrant choice of posting behavior than any other participant at SkS. That he did change when forced to do so further demonstrates that the return of the (aberrant) behavior when standards were lax was willful. Apologies to all for being off-topic. Oh look! Norman has rediscovered weather. No, Norman, from your website with its limited information, you most definitely could not draw GLOBAL conclusions. However,if you look at the data for the GLOBE, it is easier to do so. Perhaps global climate change would be easier for you to understand if you looked at the GLOBE and and Climate (rather than weather) and at the deltas. If you’ve been banned then it may be because you present really bad ideas and interpretations on a regular basis. A little bit of knowledge and inadequate understanding do not an expert make. If you disagree that weather is random and therefore unpredictable, then you must have a magic crystal ball that predicts precisely when certain types of weather occur; such as in 27 days it will rain at 2:33 pm at a particular place but only for 30 minutes, and then a tornado will hit in this particular place and follow this particular track and hit this particular town and miss this particular trailer park. So unless you are a god, I doubt you can predict when weather will occur all around the world with any degree of precision. Now, climate, climate is much more predictable. For example, we know it will be generally colder in winter and warmer in summer. If New York, for example, represents global temperature in your mind then why would not Antarctica represent the climate of the Sahara desert. I mean everyone knows that they are both the same temperature right because the weather and climate of a single place represents the planet. Right? So you rely on a narrowly scoped interpretation to represent the planet and have no idea how stochastic weather is, while simultaneously expressing arrogance that you know what you are talking about. Why don’t you post your full name as many here do. Or are you afraid of looking ridiculous for using such poor logic? This is an issue of extreme importance and urgency in the design and construction of infrastructure. For example the basis of engineering design for a public water supply in Texas was has changed as a result of the recent drought. Even when the drought ends, we will not know how frequent such droughts will be in the future as the Arctic warms and atmospheric circulation changes. Statistical approaches can look a few years into the future. However, with planning, permitting, finance, design, and construction, it may take 10 years to put a new water supply in place and have it operational. Then, a water supply is expected to last for generations. In a time of climate change, statistical approaches based on past data, cannot look 20 or 50 years into the future to see what conditions climate change will impose on the water system. In the past, the paradigm would have been to simply say we can expect such a drought at a particular frequency. (i.e., Climate change was very slow.) Now, we have nonlinear conditions where we have to engineer infrastructure on the assumption that some extreme conditions will be more frequent in the future than they were in the past (Fat tailed PDFs), and some conditions will be less frequent. For example, cold days may be less frequent, but extreme cold events more intense (long tailed PDFs). Thus, we will see a shift in average temperature, a widening of the PDFs, and the PDFs are likely to become highly asymmetric, all within the foreseeable future. Moreover, note that PDO offers two semi-stable climate states meaning that weather event PDFs may have 2 or more nodes; and since weather effects can be the result of wind and rain or wind and snow or in the case of freezing rain the temperature of different media, weather event PDFs may be multidimensional. Changes in weather PDFs make planners, engineers, and decision makers – dither. Dithering is is expensive. And, planning and building to standards not warranted by past climate conditions is a very hard sell. We are going to waste capital repairing stuff (to the old design) that would better be rebuilt to withstand the rigors resulting from global warming. However, the single largest cost from the shift in average temperature, widening of the weather PDFs, and the weather PDFs’ asymmetry will be in agricultural production. Modeling agricultural production with normal weather PDFs based on old data is like a physicist modeling egg production by assuming spherical chickens. It is not useful. Sounds like Norman is vying for Borehole status. I think it’s a question of fashion. When I was young it was eggheads, nobody liked ’em. Reagan introduced “I have read it and I do not understand it” about his science report (sloppy perhaps, but that’s the gist). Popularity and conformity has always been more important than schoolwork, and with mega-entertainment and sports, fake life “reality” shows, and electronic access 24/7 it is now possible to ignore the arduous process of learning and the experience of acknowledging uncertainty altogether. Building up understanding and knowledge is so 20th century! And our political know-nothings are now in charge. Who needs expertise when they have Inhofe, ALEC, and the troops. All this carefully fed by the metastasizing nexus of conservative think tanks fueled by the vast profits of the ownership classes bent on deregulation and quarterly profits. Our education is out of whack, and teachers don’t get either respect or compensation commensurate with their real value. It would be laughable if it weren’t tragic that research is equated with lobbying when comparing funding. All this is very OT and I will understand if the moderators regard it as too political and ban or edit it. It’s another kind of heat. OTOH, with things getting so weird, I am finding laypeople are increasingly eager for knowledge, but the political classes are eager to distract them from those fears and feed other fears more conducive to ignorance and inaction. Just checked out the borehole – very informative. It’s important to remember that among the persistent distractors, some are paid for the work, though we cannot “officially” identify which ones are just fellow travelers, wishful thinkers, and groupies. I would like to speak with you sometime to share ideas on these topics. You are entitled to your opinion Steven. I have been compiling information from NOAA to determine if severe weather events may or may not be increasing. One type of data I was compiling was wind speeds from thunderstorms 70 knots and above. I found some interesting information and consulted an NOAA meteorologist concerning the information. I will post a copy of my email and response and you can then determine if I am not engaged in proper research methodology. I am doing some Climate research and using the NOAA “Storm Events” page as a tool. I was logging thunderstorm winds 70 knots or above per year starting with 1980. I am wondering if many more storms became a reality or if reporting methods have taken on a new evolution of detection (maybe using doppler radar). From 1980 to 1993 there is a steady amount of storm events with wind speeds 70 knots and above in the 100 range. Then after 1993, in 1994 and 1995 you have a doubling of event count. After that the numbers double again into the 400 event count and in the last few years (2008 to current) the number is now in the 600 + range of events. Either the weather is getting more extreme at some exponential rate or the rapid increase in numbers is caused by better detection methods. Rather than guess at the answer I was hoping to get a response from an expert in the field. Thank you so much for your time. I am hoping you may be able to answer this email. There has also been an increase in population in rural areas and technological advances in computing and communications. For example, Storm Data from 1959-1992 consisted of typing (using an old typewriter) the storm reports on a NWS form F8. This took a while and only confirmed, verified reports were considered worthy to be included due to the time factor. In 1993 (a date you mentioned), the NWS began using WordPerfect 5.0 and a computer, allowing for more reports to be added with less time consuming work. The use of Newspaper clipping services were also utlized, providing the NWS office several more reports that might not have been reported directly to the NWS office. In 1996, the NWS moved to a database program (Paradox 5.0 then 7.0) and saw the increase of reports generated by the use of more weather spotters, using local law enformcement officials and emergency managers to assist in the collection and dissemination of Storm Data through Local Storm Reports (LSRs) and the advances in the newest computer system, the Advanced Weather Information Processing System (AWIPS), which also allowed offices to coordinate better as thunderstorm cells tracked across multiple County Warning Areas (CWAs). And your other assumption is also correct. The advances in radar and satellite have allowed for more detailed areas being targeted for post storm damage surveys. In October 2006, the NWS began using a web-based entry into Storm Data, making the entry of events even easier and less time consuming. In addition, global climate change can be considered as possible factor in the increase in more extreme weather, prompting additional storm reports. I would have to say that it is a combination of many factors that have been responsible for the spike in the number of severe weather reports and thunderstorm wind speeds/gusts. I do not think you are understanding the point I made about weather. Long term prediction of weather events is not currently possible but that does not mean weather events are random. With a dice throw each toss is not dependent on the previous throw. This is true randomness. With a high or low temperature reading or record setting events, they are not random fluctuations in the environmental field. High temperature events can occur when a low pressure system pumps warmer air into a normally cooler area. The rise in temperature is not random but a predictable phenomena. Weather forecasters can indeed predict the temperature will first rise (days in advance) and then fall by observing the motion of a low pressure system.